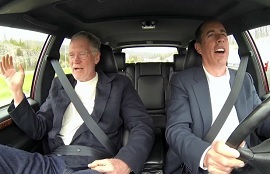 If you never saw the Comedians in Cars Getting Coffee episode featuring David Letterman, now is the time to cue it up. 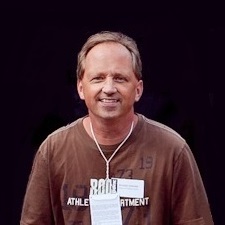 There will be many tributes, even more articles and a few showcase interviews before Dave finally hangs it up in 2015. But for our money, all of these artifacts will have a hard time matching the entertainment value of the Crackle series. Part of the reason the Letterman episode is so memorable is that host Jerry Seinfeld, for one of the very few series times, drives not one of his own car-collection vehicles but rather two sets of wheels belonging to the guest. And what a car the marquee vehicle is – a Volvo 960 station wagon, stealth-souped with a race car engine for Dave by late, great pal Paul Newman. The other principal reason this Coffee klatch is worth watching now is that it is a career retrospective, but without any of the forthcoming pomp and circumstance that will no doubt drive Letterman crazy. During the conversation with Jerry, Dave slips in a sly little Jay Leno dig (“Get a little something for yourself…”), breaks down one of his all-time great ad lib moments (“Have you ever had the hump of a camel?…”) and remembers the challenges of opening in Denver for Leslie Uggams. Once Seinfeld and Letterman return to the Connecticut start point, it’s time for spin #2 in Dave’s all-electric Nissan Leaf. It all adds up to an episode worthy of Comedians Top Ten status.